Well had some time today (finally) to do a blog post. I have been BBQ-ing but just haven’t been able to find the time to blog (although I did tweet photo’s on previous occassions). Yeah I know need to MAKE time to do these blogs. 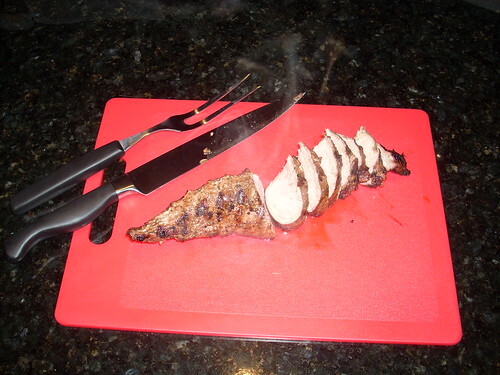 Anyway here goes, decided to try some jerk pork tenderloins. Went to my local favourite butcher and got 2 medium seized pork tenderloins. 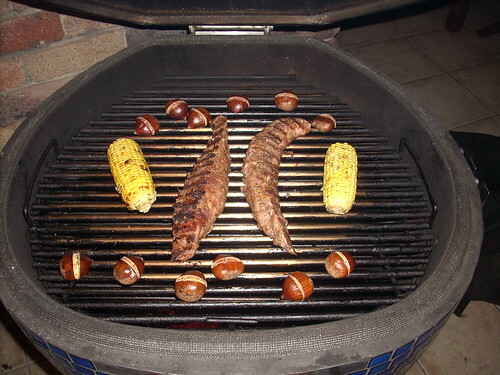 Also got some corn (always easy) and some chestnuts (just to try them out). Place all ingredients into the small bowl of a food processor or blender and process until coarsely chopped. Alternatively, grind together in a mortar and pestle. Smother onto chicken or pork and allow to marinate for a few hours or overnight in the refrigerator. I cheated and didn’t marinate overnight but only for 5-6 hours in the fridge. I fired the Komodo Kamado up around 17:30 and reached my target temps (350F / 180C) at 18:00; gotta love a new bag of charcoal (it makes difference)! As you can see I made cuts in the chestnuts (using a stanley knife) and there was plenty of room. I rotated the corn every 5 minutes, the chestnuts twice and the tenderloins once. The chestnuts were great (always have some salt to sprinkle over them) and peeled nicely; well most of the peeled of nicely. The jerk was nice and spicy just the way we like it! This entry was posted in Recently Posted on April 19, 2009 by paulr. I love jerk, and was wondering what to cook today. Might do either jerk chicken or pork.